The first Strawberry Festival was held in 1947. O. G. Traughber owned the processing plant west of the square and employed many in getting the crops processed. When the strawberry crop was processed in 1947, he decided to hold a celebration of sorts. There were queens, a square dance and food galore. The first queen was Ruby Jackson. The festival continues today and has raised money for the ambulance service, the fire department, the community park, and the downtown park square. Today the Chamber of Commerce oversees the Strawberry Festival. Adairville was first called Dromgooles’ Station in the late 1700’s and was still referred to as such, when on November 10, 1818 it was platted by Gen. Robert Ewing and Mr. Michael Traughber. 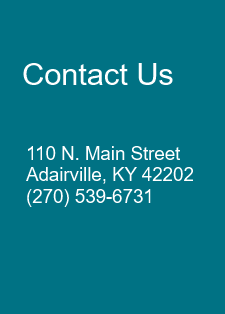 At this time, they changed its name to Adairville in honor of John Adair, who served in Indian wars and commanded Kentucky troops at the Battle of New Orleans in 1815. He was also governor of Kentucky from 1820-1824. Adairville was incorporated in 1833. Adairville was originally spelled Adairsville! The “s” was dropped sometime between 1833 and 1881. Peter Cartwright is in our history books as a contemporary of Abraham Lincoln, defeating him to serve in the Illinois legislature but losing to Lincoln in the 1846 race for U.S. Congress. Cartwright lived his boyhood at Adairville and was converted in 1801 during the era of the Great Revival or Second Great Awakening. In his own words, he said, “Divine light flashed all around me and unspeakable joy sprung up in my soul.” Red River Meeting House, near his home, was one of the three churches in which the revival was centered. The Red River Church has been referred to as “The Seat of the Great Revival of 1800” and that the revival was “the preserver of Christianity” on the frontier when greed and wealth threatened to supplant God and Country in man’s lives. Easterners were shocked by the religious indifference of the frontiersman. This small plot of land with a replica of the meeting house stands just a few mile northeast near Schochoh. Savage Cave, just east of Adairville, was added to historical sites in Logan County in 1970. The Savage Cave site has been the focus of numerous excavations by professionals, amateurs, and enthusiasts for over half a century. Early interest in the site primarily concentrated on the discovery of evidence for ‘Early Man’. The previous owner, Genevieve Savage, did much to promote the site and attract attention to the vast amount of prehistoric material she was collecting from it. Ms. Savage was instrumental in getting this site recognized in the 60’s and 70’s when Carnegie Institute did many digs in the cave finding many significant artifacts. In May of 1806 one of the most famous duels in American history was fought just outside of Adairville and near the Kentucky – Tennessee state line. Andrew Jackson and Charles Dickinson two prominent Nashvillians fought a grudge duel to the death. Each man shot the other with Dickinson dying later in the day. Jackson was disgraced for not following proper dueling procedures but regained his popularity after the famous battle against the British in New Orleans in 1814. He went on to become the first U.S. President living west of the Appalachia Mountains. The Hite House, home of Major George Hite and his wife Nancy, is about 2 miles east of Adairville. Nancy was a sister to Robert James, father of Jesse and Frank James. Robert was born in Lickskillet, a little farther to the west of Adairville. It is told in Dr. George Simmons’ diaries that he was summoned twice to tend to Jesse, once at the Hite House. This particular time Jesse had overdosed on morphine and the good doctor had to stay with him the entire night to minister antidotes and walking him through the night. The other time he was woken from his bed, blindfolded and rode to a cave to take care of a gunshot wound. Dr. Simmons wrote that the wounded man asked him if he knew who he was, to which he replied, “I believe you are Jesse James”. Jesse asked him where he banked and he said the Bank of Adairville. Jessie promised him he would never rob that bank. A couple of the Hite sons rode with the gang. It is also said the gang hid here after robbing the Russellville bank.